This post has been sponsored by Sundown® Naturals. All thoughts and opinions are my own. 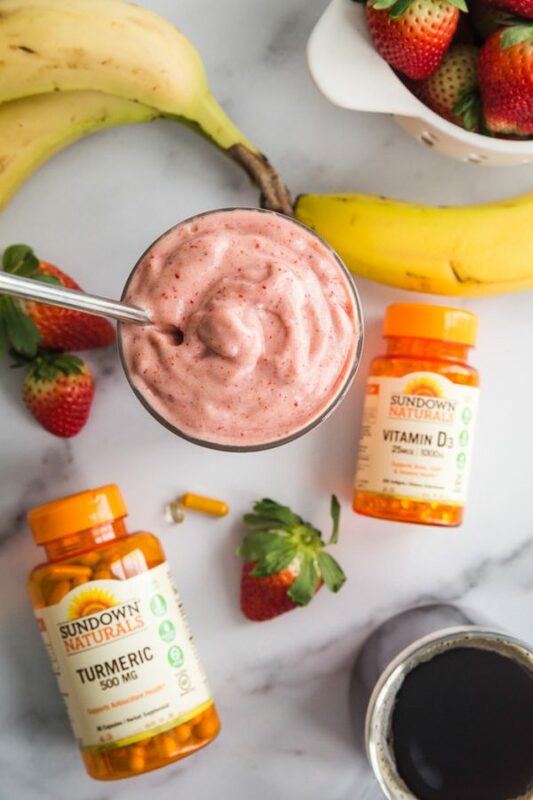 Have a great day with a simple, healthy, and easy on the go smoothie and add some daily vitamins from Sundown® Naturals! If you’re looking for a weight loss smoothie, the banana can be swapped out for cauliflower to add in some extra veggies! Hopefully you know by now that I am OBSESSED with a good smoothie in the morning. It’s the best way to start the day, and I have SO MANY great smoothie recipes that I like to rotate through so I never get bored. Something else that I’ve tried to be better about in order to start my day off right: daily vitamins. 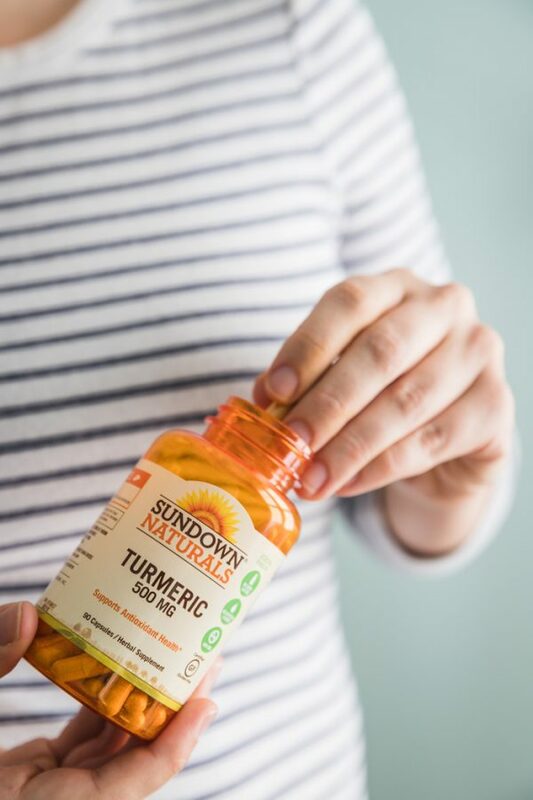 I was recently introduced to Sundown® Naturals‘ wide range of vitamins, and I have been LOVING them so much! As you’ve seen me talk about quite a bit on my Insta stories lately, I’ve been trying to seek out better products (beauty products, cleaning products, food, etc.) and that’s how I landed on Sundown® Naturals. You won’t find genetically modified ingredients, gluten, wheat, dairy, lactose, or artificial flavors in any of their products. PLUS, we could all use some added vitamins in our lives—right? As part of my partnership with Sundown® Naturals, I’m excited to share a great deal with you. 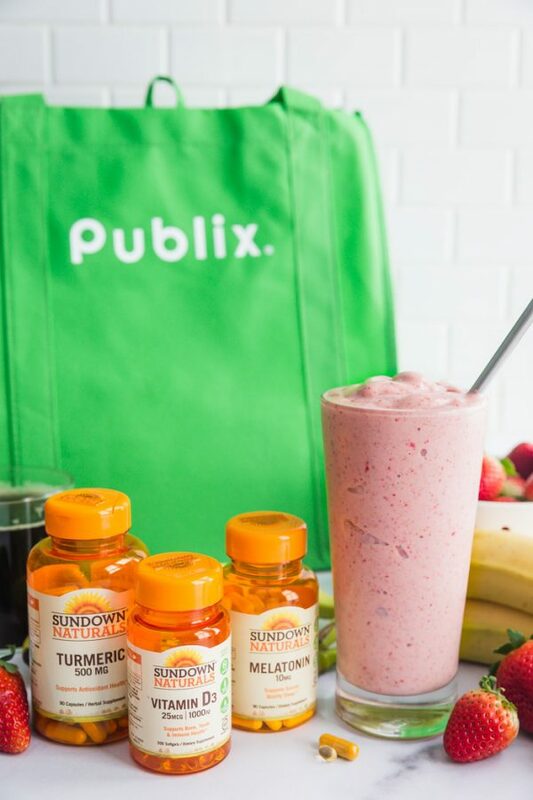 Sundown® Naturals Products are on sale at Publix for $4 off 2 from February 9 until February 22! Also, look out for an upcoming coupon in your paper on February 10. Check HERE to find your local Publix. Another bonus of Sundown® Naturals is that you don’t have to order them online (although you can do that if you want! ), and you don’t have to drive around to a bunch of fancy health food stores. You can pick them up while you’re doing your regular shopping right at Publix! If I wasn’t able to do that, I’m afraid I would never remember to pick them up regularly. I’ve been told that a new look to the Sundown® Naturals’ products is coming soon, so be on the lookout. I’ve always been able to find it with no problem at Publix in the vitamin section. Turmeric – turmeric has been ALL the rage lately and rightfully so! It packs a lot of punch when it comes to health benefits, and I’ve LOVED cooking with it recently. But since I can’t add turmeric to all of my dishes, I also like to take Turmeric tablets to get a greater amount of good antioxidants* in me. Vitamin D3 – this vitamin is an essential nutrient that works with Calcium to maintain strong bones and teeth AND helps aid in healthy cellular function*. I like to always get extra vitamin D around this time of year when the sun isn’t out much. Melatonin – This vitamin is a natural hormone that helps control your wake and sleep cycles. Obviously, this is not something that I take in the morning but I do occasionally take it at night to help get a good night’s rest*. It’s especially helpful when traveling and when my sleep has just generally been disrupted by jet-lag. 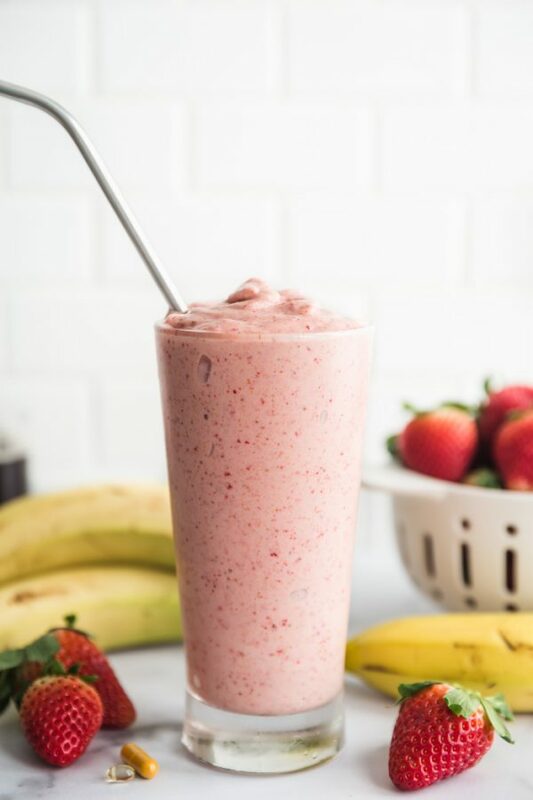 SO, this healthy Strawberry Banana Smoothie. 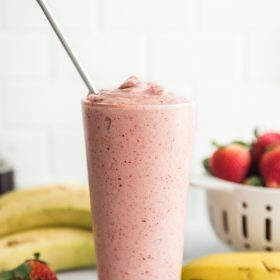 I’ve experimented with a lot of different smoothie flavors over the years, but NOTHING beats a simple strawberry and banana flavor. It also happens to be Jemma’s favorite flavor, so we find ourselves making it quite often. A cup of strawberries and a whole banana can be a lot of fruit for some people. I often swap the banana out for cauliflower. I promise it’s SO GOOD! It cuts down on the sugar in this smoothie and gives you a nice extra boost of veggies for the day. This recipe is meant to be very flexible! You can swap the banana out for cauliflower as I mentioned above. You can swap the strawberries out for any other kind of berries or even a mixed berry medley. You can use whatever kind of milk and yogurt that you desire, such as coconut yogurt or any other dairy-free alternatives. You could add dates or maple syrup to sweeten it up a bit more, but it really does not need it. 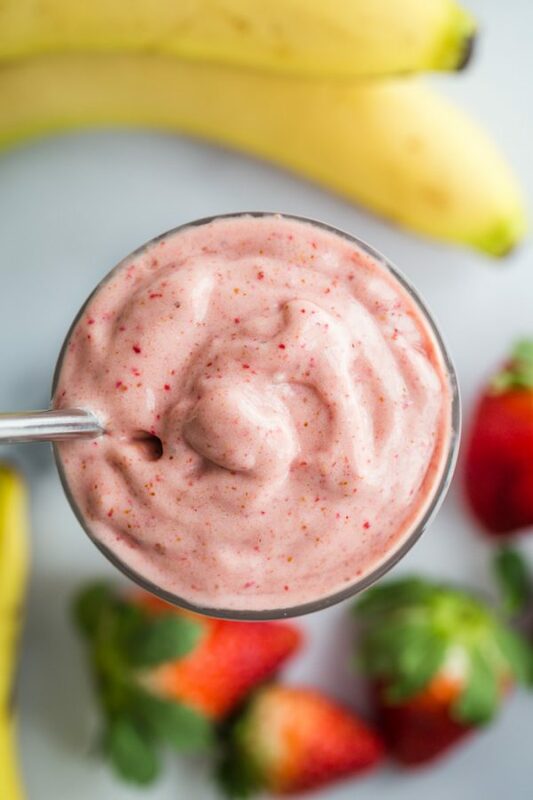 Here’s how to make a Strawberry Banana Smoothie: Add all of your ingredients to a blender, BLEND, and enjoy! 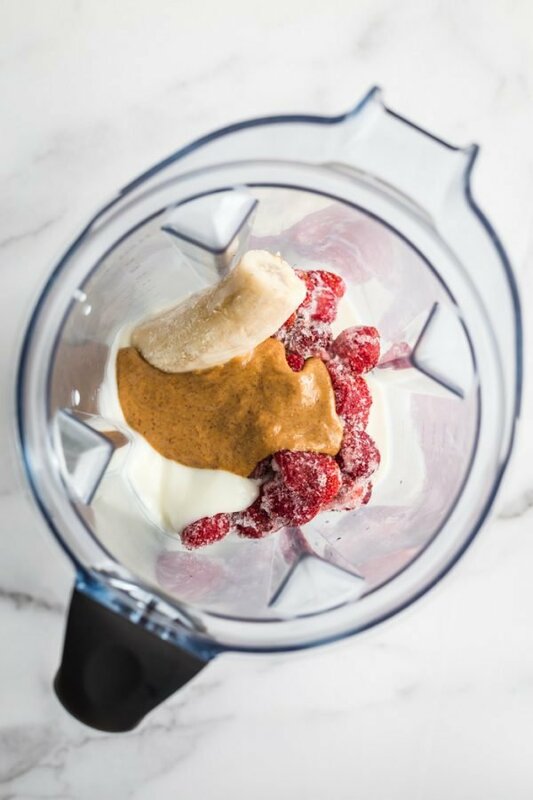 It’s legit that easy, and you should definitely be making smoothies at home more often. If the smoothie seems too thick, you can add either more milk or even just a bit of water to get the blender going again. As usual, please let me know if you end up trying this recipe. It’s so simple and so delicious! ◊Applies to all products manufactured after 5/1/15. ˆApplies to all products manufactured after 3/1/17. Please check back of label for product information. Does not apply to Sundown® Naturals Kids products except Sundown® Kids Non-GMO Multivitamin Gummies. I never would have thought of cauliflower in my smoothie! We are allergic to bananas, so often I’m “NEXT” to smoothies bc of it…. Now we have an alternative. Thanks!